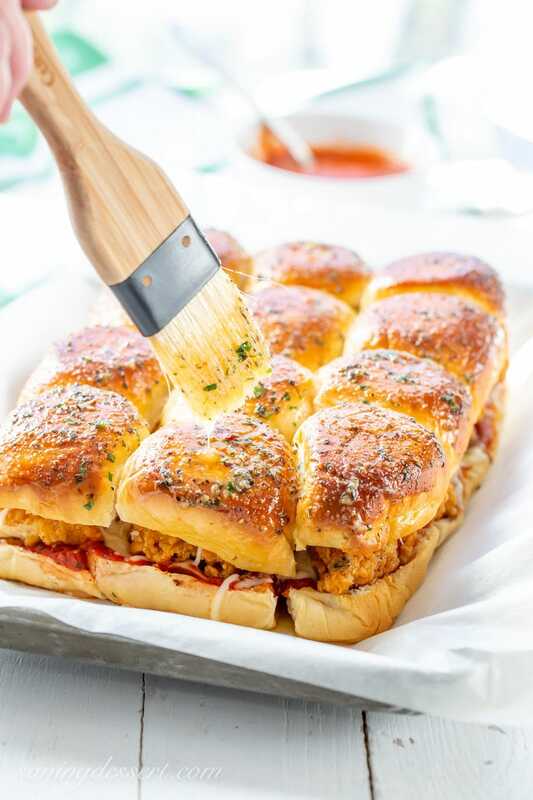 We’ve got the best saucy, crispy and deliciously cheesy, Easy Chicken Parmesan Sliders recipe to share today! 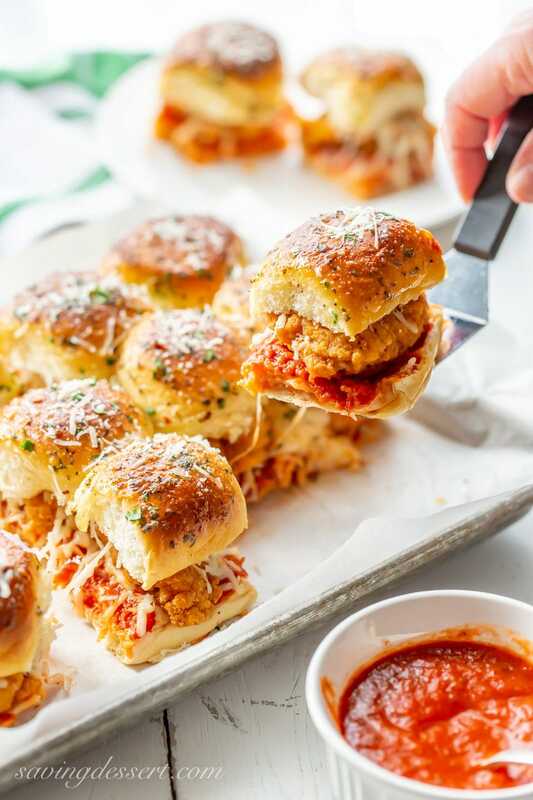 These easy Chicken Parmesan Sliders are the drool-worthy party food that everyone will fight over. Make sure you get to the table quickly because these will disappear in a flash. 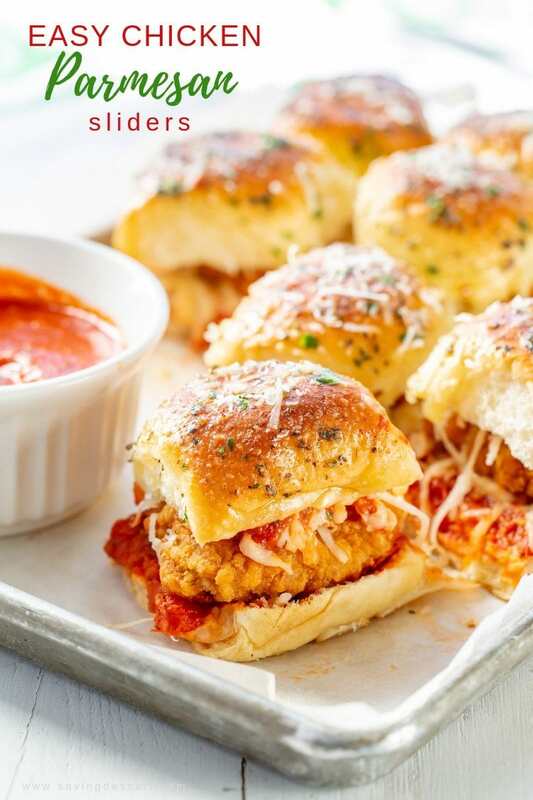 Our Chicken Parmesan Sliders are flavor bombs that are so easy to make, you’ll be serving them again and again, and nobody will complain! I love a good kitchen shortcut and these sliders are all about convenience. Made with pre-made, frozen all-natural chicken strips, shredded low-moisture mozzarella cheese, jarred pizza sauce and a package of Hawaiian rolls. It can’t get much easier! Did I mention the buttery garlic herb sauce? To prevent soggy bottoms, the bottom half of the sliced rolls are brushed with the garlic butter and herb sauce and toasted under the broiler until golden brown. This helps prevent the sauce from soaking into the rolls easily and adds plenty of flavor too. 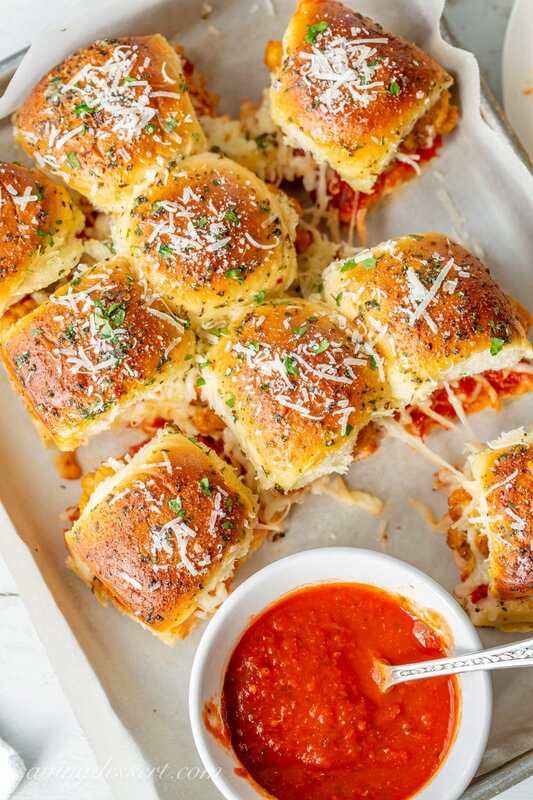 The buttery garlic herb sauce is also brushed on the tops of the sliders before baking, and after. 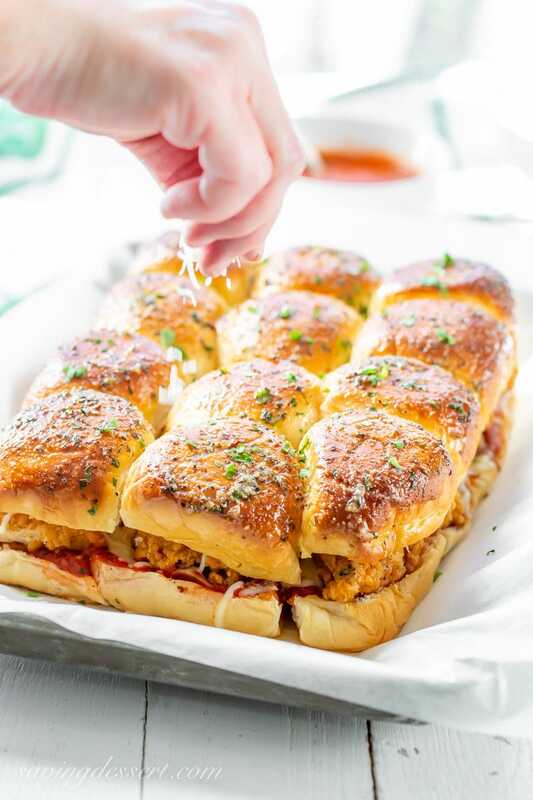 These easy Chicken Parmesan Sliders have tons of flavor in one tiny package! Once baked, sprinkle with fresh chopped parsley and more Parmesan cheese, of course! You can do all the prep work ahead of time but we don’t recommend assembling the sliders until you’re almost ready to bake. 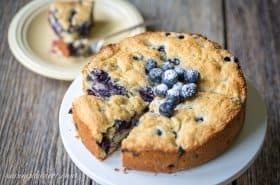 No soggy bottoms here! Served warm or at room temperature, your guests and family will enjoy these memorable hearty sliders. We prefer pizza sauce in this recipe as it’s thicker and more heavily seasoned than marinara sauces. Jarred pizza sauce has a nice punch of flavor but watch the sodium content in some brands. Pick one made with all-natural ingredients and preferably one not loaded with sugar. A 14-ounce or 16-ounce jar should be just about right for this recipe or you can make your own with our Pizza Sauce recipe found HERE. You’ll want extra sauce to serve on the side for dunking or drizzling the sliders. 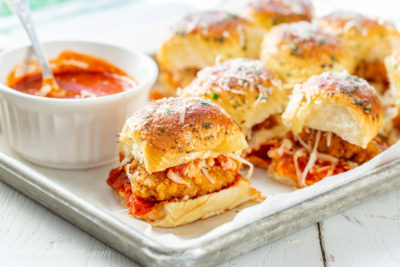 I like my Chicken Parmesan Sliders a little saucy! You’ll love this inexpensive Bamboo Basting Brush with soft bristles that won’t leave marks on pastry or proofed bread dough or rolls. The brush cleans up easily and is safe for nonstick cookware. Click on the photo for more information! Preheat oven and bake chicken strips according to package directions. Cool slightly. Cut each chicken strip into roll size pieces. You’ll need 12 pieces of chicken large enough to cover each roll. Set aside. In a small bowl combine the melted butter, garlic, oregano, basil, salt, crushed red pepper and 1 tablespoon fresh chopped parsley. Stir until well mixed. 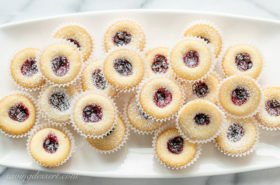 Slice the rolls in half lengthwise and place the bottom half cut side up in a parchment lined baking dish, or on a rimmed baking sheet also lined with parchment. Lightly brush the bottom half of the rolls with the garlic butter mixture. Place the pan in the oven under the broiler and cook until the rolls are toasted and golden brown. Remove from the oven and reduce the oven temperature to 400 degrees F.
Spread 1 cup of the pizza sauce evenly on the toasted rolls. Cover the sauce with the shredded mozzarella cheese, then top with 12 chicken pieces. Sprinkle with 1/4 cup of Parmesan cheese and cover with the top half of the rolls. Remove from the oven and brush with any remaining butter mixture. Sprinkle with fresh chopped parsley and grated Parmesan cheese. Serve immediately with extra sauce for dipping, if desired. We don’t recommend making these ahead as the sauce will make the bottom half of the rolls soggy. Toasting the bottom half of the rolls is optional but it does help prevent soggy bottoms! Use good quality store-bought pizza sauce, or homemade pizza sauce. Or try our homemade pizza sauce found HERE. We use Tyson’s all-natural crispy breaded chicken strips found in the freezer section of your store for this recipe. Next Post: The Game Day Edition – Appetizers and Dessert! Thanks Gerlinde. They are always a favorite! These look so good! I like your tip on how to keep them from getting soggy. Thanks Karen – it helps! 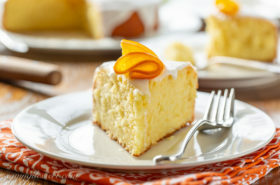 My mouth is watering! Gosh, they look great! 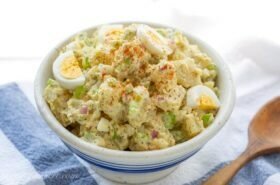 We are all about the grab and go foods lately – so good! Thanks Jennifer. OMG now all I can think of is eating a juicy slider!! You’re the slider queen Tricia, these look insane. I was hoping you’d list what kind of rolls you used. They’re beautiful. I’ve seriously never purchased frozen chicken before. Is there a good brand? 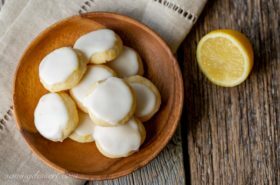 Hi Mimi – I put the brand names we used on the printable recipe. We love the Tyson’s brand chicken strips and King’s Hawaiian Rolls 🙂 Hope that helps! These look absolutely irresistible! That herb butter sauce sounds particularly yummy. I know Angie – garlic butter sauce is so hard to resist. Have a lovely day and thanks! What a great idea! I have been loving the shortcut of using the frozen breaded chicken for a number of different recipes but never thought of doing sliders! Time to party!! Thanks Chris – me too!